Whoah, it’s April. 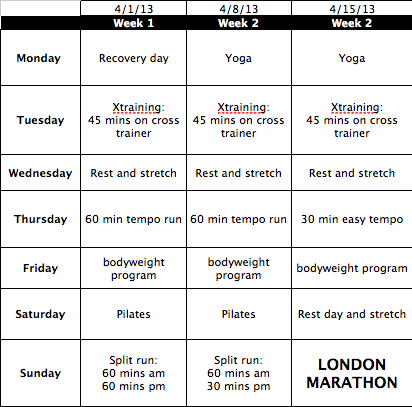 Marathon Month. How did that happen? Seems like it was only yesterday that I inadvertently signed up for the London Marathon 2013 via facebook. Lucky for me, training for the marathon has been more consistent than writing about it, though Facebook & twitter has been with me through every step of the way. Fundraising is going pretty well too. After two helpful training days under my belt [Asthma UK and London Marathon respectively], my first (and only) half marathon [adidas Silverstone Half Marathon] and my longest run before the big day, my trainer has handed me my Final Program – the tapering off one. Tapering will allow my body to reach optimal performance before the marathon by decreasing the amount of exercise I do in the lead up to the big day. The trick is to ensure the muscles are kept in good working order but also have a chance to rest. Not bad, eh? Very doable. And the best thing is, I think I can squeeze in some telly watching, sleep and chocolate too.